Tip Blockchain " The Third Generation Blockchain "
The world of modernization and cryptocurrency became the flag bearer witnessing the change. Those who use it benefit while those who are still unaware of a very magical currency have to pay because they will stand up eventually in a crowd of millions of people. As the world moves toward cryptocurrency, there are many cryptocurrencies to be worked on. Cryptocurrency users today have to deal with hashed addresses, QR codes and other tools. This creates friction and makes cryptocurrency look alien to the average user. There is a need for a better platform that can make the transaction process easier and more efficient. Blockchain Tip brings the platform for cryptocurrency transfer where users can register with their unique usernames while others can search for them and trade afterwards. This will make transactions faster, easier and more efficient. The ease of use and ease of finding comes with this platform. Tip is the only platform that addresses mass adoption issues using a holistic approach from a discovery point of view, and builds applications that connect end users to businesses. This will provide a solution that end users and merchants can use in daily cryptocurrency transactions. With Blockchain Tip, users and businesses can register a username that can then be searched and found by other users. They will then be able to transact in a fast, easy, and easy to use way. Blockchain Tip allows easy use with discovery in blockchain! Arbitrary data attached to transactions can be used for various purposes, including identifying info, memos for payment, confirmation of receipts and more. Chat with your friends and family through secure peer-to-peer connections and send TIP tokens from the right in your conversations. Sales point system for merchants to easily receive cryptocurrency payments from their customers, saving on transaction costs and time. Information about networks is indexed and searchable so that users and businesses can find information by searching using our wallets and apps where they are sold. Our lightweight desktop wallet ensures that you can connect to the Tip network and start sending transactions whether you're at home, at work, or on the go. Tip is a blockchain platform that works based on a three-tier system. Peer to peer Cryptocurrency transaction - Makes crypto transfer process easy with their platform because previously the long address is confusing to remember but now unique user names help users to easily talk to each other and make transactions via Tip token. Simple and efficient mobile wallet - Buying cryptocurrency is difficult but storing it safely is a different ball game but with a wallet Tip it is easy and efficient. Payment point sales and seller points system - This is not just a platform to transact money but is also used to buy and sell goods directly from the merchant itself and pay headaches via Tip tokens. To illustrate the main problems users face when using cryptocurrencies today, let us present a few scenarios. These scenarios will illustrate how present-day solutions are inadequate for dayto-day use of cryptocurrencies by the average user. For our first scenario, let us assume we have two users, Bob and Alice. Bob needs to send Alice a cryptocurrency transaction to repay her for lunch she bought him today. With existing solutions, Bob would somehow have to get Alice's wallet address from her. If they are in person, Bob could scan a QR code containing Alice's wallet address. If they are not in the same location, Alice could send Bob her address hash by copying, pasting and sending it to Bob over text messaging, another messaging app, or by email. These additional steps to initiate a transaction create unnecessary friction which puts off users. Most users who are not used to cryptocurrencies would think these steps to be too much of a hassle and not even bother using cryptocurrency. With so many options to send fiat currency between users, for cryptocurrency to compete, it needs to be easier than sending fiat transactions. In the second scenario, we will consider the case of small businesses accepting cryptocurrency for the payment of goods or services. These could be your neighborhood coffee shop, restaurant or shoe repair store. Assuming a business, let's call it Gino's Pizza, wants to accept cryptocurrencies for payment, a common practice used today is the business displays QR code that can be scanned by customers to get the business' wallet address. Customers can then send transactions to this address using their own wallet application. This again creates barriers to entry for users who are not used to dealing in cryptocurrencies. Secondly, what if the business in question is a restaurant that delivers, and requires payments to be made when orders are placed? With fiat transactions, users can give their credit card numbers to the order taker over the phone. This is not possible with cryptocurrencies. The 5 closest thing to giving a credit card number over the phone would be the order taker reading out the store's cryptocurrency address over the phone. This would be very highly error-prone and impractical to use, as if the customer misses a single character, the transaction could be lost forever. Businesses are hesitant to adopt cryptocurrencies due to these limitations. thus, and several transactions are processed in an hour. If several orders are placed over the phone or by users scanning the business address QR code, the restaurant operators have no way of knowing which transaction corresponds to which order. One ineffective solution would be to match the value of transactions with orders. This would not work if there is more than one transaction with equal or similar value. Another option would be the customers reading out the source address out over the phone, and the order taker recording this address, and then match addresses when transactions come in to attribute them to the correct customer. With only addresses hashes to go by, this is technically infeasible. Now imagine that the pizza shop is expecting deposits from multiple customers. It would be a total nightmare for the store employees to match transactions to customer addresses. Another ineffective solution used presently is the businesses generating multiple addresses, one for each customer or order. This is a tedious and cumbersome process for small businesses to manage, as it leaves them with an ever-increasing number of addresses to manage over time. This is another non-solution to this problem. 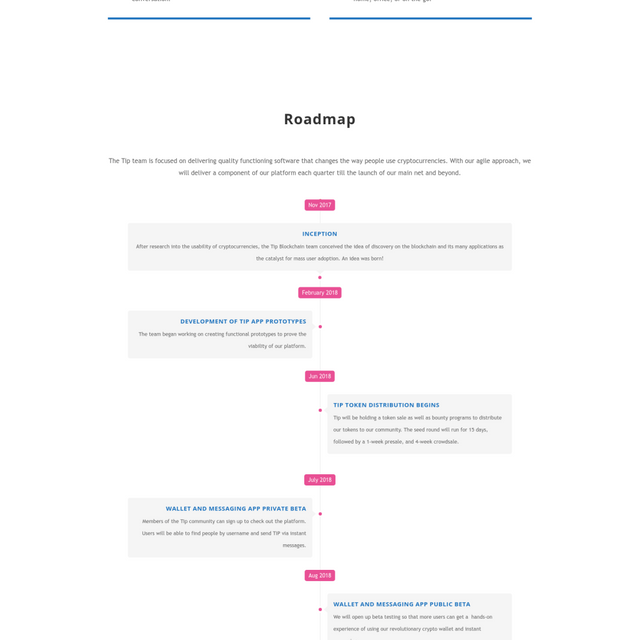 Before we get into the details on how the Tip solves the specific problems presented above, let us first understand the solutions the platform provides. The first solution presented by the Tip is unique, user-friendly addresses or address aliases. Each address on the Tip Network is created from a cryptographic hash, just like with Bitcoin or Ethereum. However, this is an implementation detail users should not have to bother with. When people wish to transact in cryptocurrency, they do not need to know the underlying addresses. Users will be able to create human-readable names or aliases on their accounts and transact using these aliases. The network maps the alias to the corresponding address, so transactions are routed correctly to the intended recipient. An analogy to this issue is if users had to find websites using IP address instead of domain names. This would have been an untenable situation that would have hampered mass user adoption of the internet. The Domain Name Service was created, which maps human-readable names such as google.com to the IP address 172.217.1.174. Just as hostnames were a critical feature for mass adoption of the internet, user-friendly address aliases are a critical requirement for mass adoption of cryptocurrency. In addition to address aliases, Tip also provides the ability to attach arbitrary metadata to both addresses and transactions. Actually, attaching an alias to a wallet address can be thought of as a special case of attaching metadata to an address. This metadata can be protocol dependent, such as an alias, or arbitrarily specified by the user. It will be stored in the form of key-value pairs. This metadata would allow for the storage of arbitrary data the user chooses to specify. Metadata storage on the Tip Blockchain will support both private and public data. Public metadata will be stored in plain text on the network, thus, would be accessible to anyone on the network. Private data will be encrypted by the caller and stored on the network. This data can then only be decrypted and viewed by the holder of the private key, the owner of the account. So now we know that data can be stored alongside addresses and transactions. What can this data be used for? The Tip Blockchain is a fully indexed, searchable platform. Users will then be able to discover other users and new content on the network by searching through the data using client applications. Developers will be able to build decentralized apps (DApps) that store and access this information on the network. DApps will be able to create their own custom fields and protocols to extend the usability of the platform. The first DApp built on the Tip Network, by the Tip team will be a wallet app, incorporating several features of the platform. Account aliases, search and instant messaging will be bundled into this wallet application. Instant messaging will be a central feature of the application, as the primary goal of Tip is to drive mass adoption of the Tip Blockchain, and instant messaging provides a way to do that. Users will be able to send transactions directly from within messaging conversations, or by using the traditional wallet interface. All messages will be exchanged over peer to peer connections without being routed through a centralized server. At the other end of the spectrum the cryptocurrency adoption problem, is businesses. The solution Tip provides to businesses will be another DApp, built specifically for retailers. This application will be a monumental boost to retailers that already accept cryptocurrency for payments, as it provides features they are used to in traditional point-of-sale systems, that were missing in the cryptocurrency space. It will also serve as a catalyst to getting more retailers to accept cryptocurrency payments, as it provides the conveniences they are used to with a traditional point of sale system, at a fraction of the cost. The TIP token, is the unit of account on the Tip network. It is the native currency on the network, thus is used to pay for transactions, storage and other services on the network. Transfer between peer to peer. Use it to buy things in the real world with merchants who accept TIP. To store data on the Tip decentralized database. To pay for transaction fees on the network. Reward developers for creating apps that run on the Tip Network. To vote for delegates to secure the network. For delegates to stake their coins and earn staking rewards for securing the network. The Tip platform provides an ecosystem that will allow users to purchase both digital goods and services on the platform, and also tangible goods in the real world from merchants that accept Tip token. 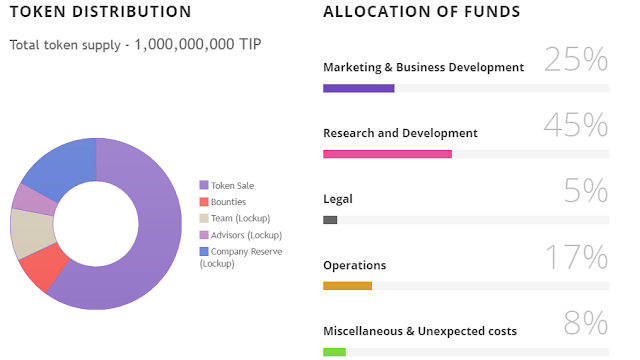 In order to generate financing to fund the research, development, and marketing of the Tip Blockchain, Tip Inc will be launching a sale of TIP tokens which will be open to the general public. Users will be able to purchase TIP tokens using either Ethereum or Bitcoin. The sale price for Tip will be 1 ETH = 10,000 Tip, or 1Tip = 0.00001 ETH. The price of TIP tokens in Bitcoin will be calculated by converting the Bitcoin value to Ether, using the Bitcoin-Ethereum exchange rate at the time of purchase. The token sale will run for four weeks. During this time, 60% of the total TIP supply will be available for purchase by the general public. TipBountyPrograms Besides purchasing TIP tokens during the token sale, users will be able to acquire TIP tokens by participating in bounty programs the Tip will be launching. More information about bounty programs will be announced on our social media accounts. The main user interface will be used to connect to Tip Network is a mobile and desktop wallet application, Kasakasa. The mobile version of this wallet will use native iOS and Android apps, covering over 95% of mobile users. It will also release cross-platform desktop apps for Windows, Mac, and Linux that will provide coverage of up to 99% of desktop computer users. There is a new blockchain project, with the primary goal of making cryptocurrency more accessible to the average non-technical user. This is a Tip Blockchain project. There are other projects that focus on the advancement of blockchain technology. Tip does the same thing, but takes a completely different approach focusing on ease of use. By providing a user-friendly solution that connects users to the business, and the information layer found in blockchain, we provide an ecosystem that will be a game changer in blockchain technology and bring more users and businesses into this growing space. The next chapter in blockchain and cryptocurrency stories will be written by Tip. We will post more updates in the coming weeks and months. Join us on social platforms to stay informed and to chat with our team. Hi @ellybelo, I'm @checky ! While checking the mentions made in this post I noticed that @tiptoken doesn't exist on Steem. Maybe you made a typo ?